Location: Downtown Redmond is bordered by West Lake Sammamish Parkway Northeast to the southwest; the Sammamish River to the west; the Puget Sound Trail to the north; Woodinville-Redmond Road Northeast to the northeast; Education Hill to the east; and Highway 520 to the south. 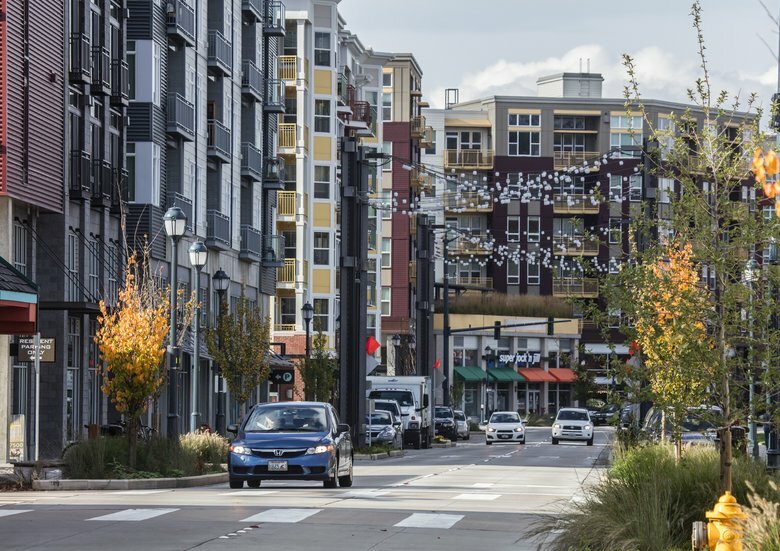 Why people move to this neighborhood: It’s an urban center with shops and restaurants (mostly concentrated around the large Redmond Town Center shopping complex), streets lined with modern apartment buildings, and it’s just a few miles from the Microsoft headquarters. Parks and trails border the city center to the south, and Marymoor Park just beyond that hosts outdoor concerts with big-name performers in the summer. Housing: Newly constructed, expensive apartment buildings and town homes in sleek, geometric shapes and bright colors. A smattering of single-family homes and older apartment buildings are on the outskirts of downtown. Recreation: The downtown area has a skatepark, plenty of window shopping at the Redmond Town Center in the southern end of downtown, and the paved Bear Creek Trail has several access points just south of the city center, connecting to more trails along the Sammamish River to the west. The city is planning a large, centrally located Downtown Park, currently in the design phase, which will provide a place for the public to relax and will also host events. Historical fact: The wooded 4.5-acre Heron Rookery near the Sammamish River is just a block away from the busy streets and shops downtown and was a nesting spot for Great Blue Herons during the 1990s. But the herons moved south to Marymoor Park 10 years later and haven’t returned. Today, a single trail runs through the forested area, but the city has talked about possibly adding other amenities or expanding the park further.